I knew that the direction the individual was headed in would result in a colossal train wreck but I was totally unable to stop it from happening. The flag I was waving, the colored lights I tried flashing, all were ignored as this friend headed unceasingly toward a certain crash. I prayed for God to intervene with His great divine hand and, like Superman, force the train to a standstill. He didn’t. The train wrecked. 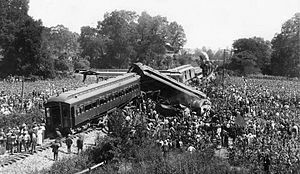 If I knew the train wreck was inevitable, didn’t God? Why not stop it? And Simon replies “Lord, with You I am ready to go both to prison and to death!” No, I know what I’m doing. Everything is ok. I’ve got this under control. And then Jesus said, “I say to you Peter, the rooster will not crow today until you have denied three times that you know Me.” Signal lights flashing, warning flags waving, and a distress fire burning. It seems that, unlike me, Jesus doesn’t feel compelled to stop wrecks. He warns about the impending danger, he prays for Disciple HeadingForAWreck, and tells him what to do after said wreck, and then…He watches the wreck. This is an amazing example. Speak, pray, watch, be ready to restore. There is a lesson here on how the Lord uses failure to grow us, but I am so electrified by this paradigm of prayerful watching that I can only focus on that.. This entry was posted in CC Posts and tagged Christianity, intervening, Jesus, Satan, Simon, Superman, Train wreck, train wrecks of life, trusting God with all. Bookmark the permalink.
. . . but USING THEM to “grow” me. The ‘train wrecks’ (after the event) became blessings. There have been many times when I wished the Jesus DID stop the train wreck from happening. But he is faithful to restore, indeed! This was great, I never thought of that before! Greg, I wish I could say I already knew and practice this, but… Very illuminating post by Cee Cee! Thanks for stopping by good friend. That is a great lesson! So true… very good lesson. The author has a great take on this. Thanks for stopping by good friend. Thanks for visiting friend! God bless.